The library will be closed on July 4th. We hope everyone has a safe and fun Independence Day! This year the reading program for patrons 18 and older will begin on June 21st and run until August 30th. We have a lot of fun, new activities planned and some great prizes we'd love to give away! Starting July 5th we will have bi-weekly drawings as in years past, but this year we're doing something special. On the days we draw the winners we will have Brown Bag Lunch Book Discussions at noon. Bring a lunch and enjoy the drawing, as well as beverages and desserts that we will provide. It is a great chance to discuss what you have been reading with fellow readers! The drawings will be on July 5th and 19th, and August 2nd and 16th. Also, all patrons who enter will be eligible for the Grand Prize, given away at the August 30th finale. This year we're giving away a Nook HD Tablet, an iPod Nano, and a gas gift card at our wrap-up Ice Cream Social held in the library at 3 pm. Coming Soon to a Library Near You! If the computer gods prove merciful and our IT guy resourceful, in July we will begin offering Out Yonder Printing. 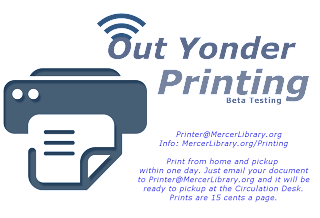 Basically, if you're trying to print something "out yonder" or in other words outside of the library, you can email it to our library account. 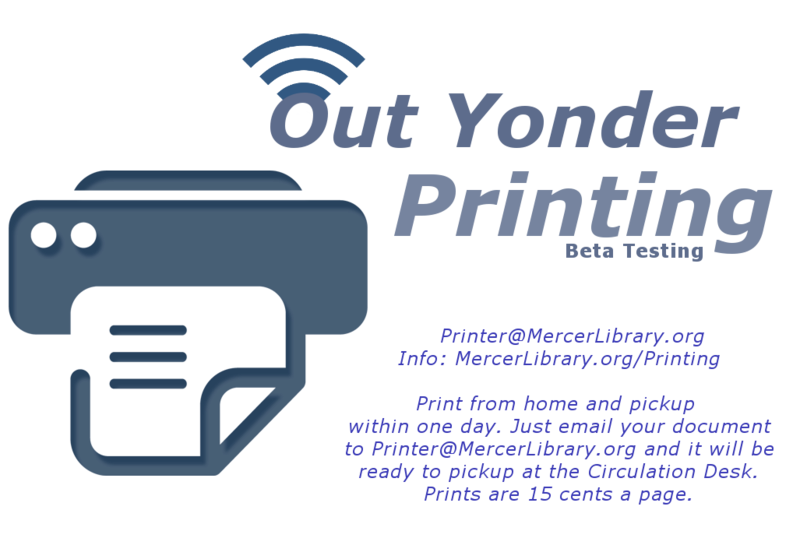 If you come into the library within 20 hours, we can print it off for you at 15 cents per page. We hope this will come in handy if you're trying to print something but your printer just won't cooperate or is out of ink, etc. As long as you have an internet connection and an email, you can print things at the library from anywhere. This year the wrap-up party will be on August 2nd at 9:30 a.m. As usual, it will take place at the library and any child signed up for the program who has read at least ten books is invited to attend. After a great summer of good books and fun crafts, we celebrate with balloons, cookies, and cool prizes. Zak Morgan, a hilarious performer, will be giving a show with his music written especially for children. It's always a lot of fun--be sure to stop by! The SEO library consortium is making a few changes to their online subscriptions available for patron use. Unfortunately, we will no longer offer the Chilton's Database for DIY auto repair enthusiasts. Although Chilton's will be off the system, we still have auto handbooks and repair manuals available.